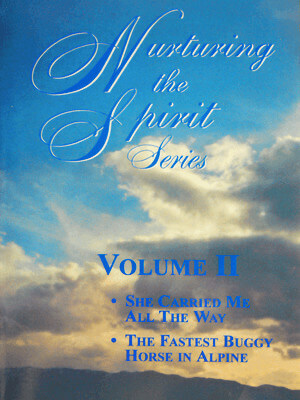 The Nurturing the Spirit Series will more than just touch you… it will awaken you, enlighten you and keep you reading for hours! She Carried Me All the Way, is an unforgettable story of a girl and her sister crossing the wilds of the western plains. Mystery ensues when their mother continues to be caught up in her personal grudges against the cause. A story that you will talk about for weeks. The Fastest Buggy Horse in Alpine is about families who settle in a little village in Utah. The stories are about two little girls who share growing up experiences. Their greatest fear was old Zet, the horse that was too fast, but was always there to save the day.